There's never been a better time to get your child on the trails! The holiday season is here, and if you’re a fan of bike riding, you know just how special the freedom of a bicycle can be. This year give that grom in your life the gift of two wheels instead of the gift of a glowing screen. Get them out in the fresh air, so they can explore the world, first-hand, by bike. If all your budget allows is a $95 bike from a big box store, don’t let that stop you from getting your kid rolling. Any bike is better than no bike. Just make sure, if you buy the bike assembled from a department store, that the bike is safe and put together properly. I can’t tell you how many times, I’ve seen a fork installed backwards on a bike from Walmart. If you’re not sure how a bike should be assembled, your local bike shop will be glad to make sure you and your child are riding safely. Now, let’s check out some incredible 20-inch wheeled mountain bikes for the youngest of shredders. A bike with 20-inch wheels is basically the smallest option if you’re looking for gears. I was able to get a hold of three nice mountain bikes, and as my 5-year-old became the tester, I watched him go from pushing a BMX bike up the hill, to learning how to use gears and hand-operated brakes. All of these 20-inch mountain bikes were probably a bit of a stretch for my boy in terms of sizing, but gears were must. He was tired of pushing his singlespeed, coaster-brake BMX bike up little climbs, and he was ready to roll longer and farther. The big baller of bunch, and the bike that looks most like an adult mountain bike shrunk down for a kid, is the Norco Fluid 2.3+. At $579, non-mountain bikers may have sticker shock, but this machine is trail-ready with front suspension, 20 x 2.6-inch wide, high-volume tires and dual disc brakes. 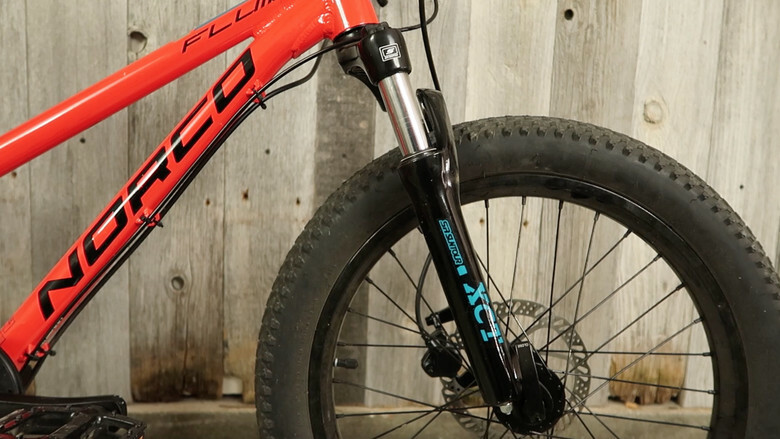 The Suntour XCT Junior 20 fork gets 60mm of travel. 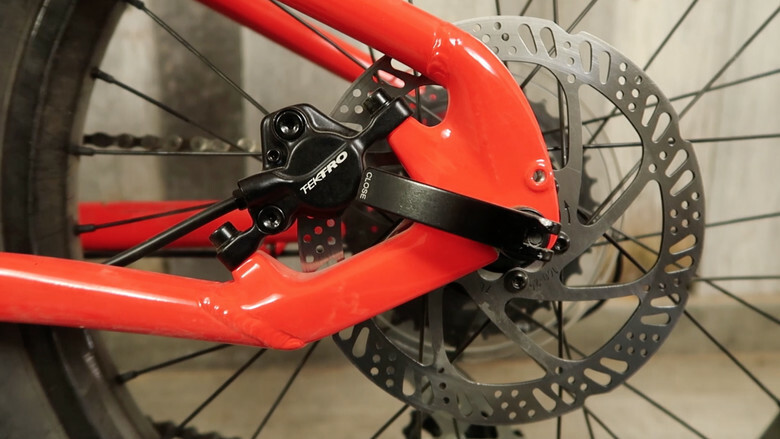 While it’s basically just a spring with some preload adjustment, it’ll take the bite out of some trail bump and makes the Norco look like mom or dad’s MTB. Shimano handles the drivetrain duties with a nice 1x8 set-up featuring an Altus rear derailleur and 11-34t cassette. It has 152mm cranks with a narrow/wide 28t chainring. The low gearing means your child will be powering to the top of any climb right next you. The seatpost quick release is super handy for on-the-fly saddle height adjustments. The contact points on the Norco are junior-specific which is a must-have in this category of bike, especially with extra-young riders. Brake lever position for my 5-year-old was the hardest thing to get dialed on any of these bikes and the Tektro disc brakes on the Norco had the most quality range of adjustment. At first I rolled my eyes at a bike for someone so young featuring hydraulic disc brakes, but for the practicality of lever reach adjustment alone, they are the cream of crop. The bike isn’t light, at a little over 25 pounds, with a big heft coming from the fork. But that didn’t seem to matter for our mini tester. His 16-inch Mirraco BMX bike that we found at the thrift store for $5 weighed 28 pounds! Out of the bikes he sampled, the Norco was his favorite. It could be the looks of the big tires, the fork and the brakes, or it could be the performance of those items. 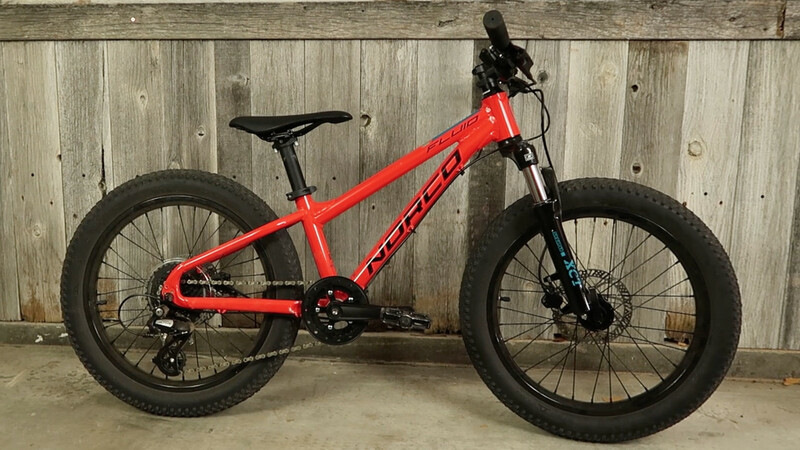 Instead of $600 bucks on a phone, video game system or tablet, the Norco Fluid 2.3+ is money well invested for any child ready for real mountain biking. If you’re extra serious, you can even triple your spend and double the suspension as Norco offers the Fluid 2.2 FS — a full-functioning full-suspension beauty with tuneable air-sprung fork and RockShox Monarch rear shock at $1749. At nearly half the price of the Norco, is the affordable and diverse GT Stomper Prime for $300. It’s a 20-inch-wheeled mountain bike that has great geometry and sizing for the youngest of riders. The GT uses what they call LegitFit, based on Schwinn’s SmartStart idea for early riding. The GT had the best standover clearance with their dropped top tube and Triple Triangle layout. Additionally, the 110mm cranks were relatively short, and even my 39-inch-tall 3-year-old was actually able to ride this bike once I lifted him up on to it. He could pedal around on it as long as I was there to catch him at the end of the ride because he couldn't reach the ground. The Stomper also incorporates a Shimano Revo twist shifter, which was a highlight for our tiny-handed tester. He didn’t have to reach for the triggers and definitely learned the art of finding gears best on the Stomper thanks to the ease operation. The 1x6 drivetrain tops out with a 28t cog out back and a 30t chainring. Paired with the shorter cranks, climbing was still very possible, but the low end of the gear range was a bit limiting and he found himself pushing on occasion. Considering we’re not chasing 3-hour epic ascents, our goal of some low-gear climbing and learning how to use a shifter was definitely achieved. Because the bike had v-brakes, set-up for the smallest hands can be a bit difficult. I maxed out the grub screw on the lever to get the reach close enough for little fingers. But for the brakes to be functional with some bite on the rim, the cable adjustment leaves the pads really close to the rims. If anything goes out of whack, there’s some rubbing. 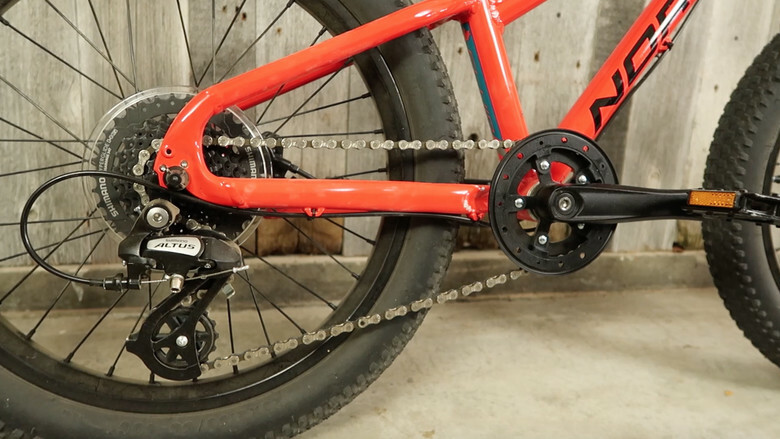 The 2.1-inch Kenda Small Block 8 tires are great for the BMX track and smooth singletrack we have nearby, and at a little over 21 pounds, the GT was a manageable weight. The Stomper is a great first mountain bike for the smallest of riders and will get them hooked. Trek’s Wahoo 20 was the lightest of the bunch at just 19-pounds. The bike has that longer rear end look that a lot of kids’ MTBs have. The standout piece of the bike, however, is the Alpha aluminum frame. For the young rider ready to follow mom, dad or sibling on a legit cross-country ride, the Wahoo uses fast-rolling tires, 140mm cranks with 32t chainring and Shimano 11-34t 8-speed cluster out back. The rear rim is orange, the front is black, and it even has water bottle cage mounts, so your mini ripper can sherpa their own hydration. At $439, you get a quality frame that will definitely grow with your child. Trek recommends the rider be at least 45-inches tall and our micro masher comes in at an altitude of 43 inches, but we made it work and he had fun on the Trek. Brake lever reach and operation with the Wahoo was challenging with such small hands. I backed out the grub screws in the levers all the way and replaced them with longer (and uglier) screws to get the levers close enough to for him to grab. The ghetto hack did the job, but like with the GT, pad contact and brake adjustment on the v-brakes is all but maxed out with no room for wobble or error. The Trek was the guinea pig for learning hand-brakes and it took a beating despite some failed coaster-brake-backpedal memory lapses. The Wahoo 20 is a great starter MTB for the up-and-coming Trek fan. The crew at Trek also sent over a Bontrager Solstice MIPS Youth helmet. At $60, it’s not cheap, but it features the added protection of MIPS, it has an easy-to-use lockdown strap in the rear and a Fidlock, magnetic buckle system. My boy loves the Fidlock. He can operate it easily and dad’s not gonna pinch the skin under his neck with a stock buckle like I did when he was 3. SDG just released their kids-specific component collection called the Junior Pro Kit. The kit features the Slater 650 handlebar with 19mm grip diameter that works with their Slater Junior grips. The smaller grip diameter means little hands will be in more control. 3mm spacer adapters are supplied so normal, 22mm-sized brake and shifter controls can be used on the 19mm bars. The 19mm diameter, however, is promising for V-brake-equipped bikes. There is a junior v-brake lever made by Tektro that works only with 19mm bars. The reach on these levers is nice and close to the bars while providing enough cable pull for a *normal* brake arm set-up. I have these levers on order from Cleary Bikes to see if they’ll help with some of the issues mentioned earlier and will report on them soon. Cleary offers a kid’s bar with 19mm diameter but, their spec is pretty goofy, so I was glad to see SDG come to the rescue with the Slater bar. The SDG Junior Pro Kit also includes the Fly Junior saddle and Slater 90 pedals. The pedals provide a solid platform and are a killer upgrade from the stock after-thought pedals of a kid’s bike. They even have replaceable pins since your grom will be smashing rock gardens soon. Aside from what’s been discussed here, there are a boatload of grom-ready shred machines. All major bike brands have some kind of gear-equipped 20-inch-wheeled mountain bike for the kids, and they’re getting more modern and updated every year. Specialized, Commencal, Kona, Scott, Spawn Cycles, Early Rider, Trail Craft…the list goes on and there are plenty of mini machines that will put your grown-up MTB to shame. We’re just scratching the surface with some of these mountain bikes for kids, so hit up your local bike shop, ask friends and neighbors or just see if your child has a special bike wish. If you can’t spend $600 on a kid’s bike and can only spend $60, it doesn’t matter...just do what you can to give the gift of bicycle freedom this holiday season. great info and can't agree more on the geo. my littlest guy in the vid is on the specialized riprock 12 bike. the geo is proper on that. he's shredding on it, my older boy learned on it. seeing the geometry on the 12-16" department store bikes is borderline frightening. there are some strange setups out there. it'd be no surprise if a lot of kids hate bikes b/c they started on something so goofy. i've also seen some little rippers at the bmx track on the most awkward bikes, so kids adapt well if budget is an issue. i could see the norco with a rigid fork being basically perfect right now for reasons you stated. trek's roscoe 20 is plus with rigid and looks good. there a bunch 20" plus-tire bikes for groms out there and it's so cool to see. interesting about skipping 24" too. Why Orbea's MX20 is missing from this presentation? Bought my daughter a Commencal Ramones 20+ in silver for Christmas.... Got a few purple ano bits to girly it up a bit. Steered away from a suspension fork as I read they can can make it too heavy for smaller kids... She's only just turned six. Also swapped the grip shift for a trigger shifter, people say the action is too hard for small hands and after trying it I'm inclined to agree. Apart from that has mechanical disks brakes which should slow her down well until she get bigger, then I can put a set of hydraulic ones one, have a few sets about. Is Trek Hinting at a Natural Fiber Construction?